The last time we ever tried brioche in this kitchen, miss 14 was dismayed to find it required overnight proving. And copious amounts of butter to be slathered over the buns. The result was less than perfect because there were so many elements to get right in making them by hand. So she gave on making them again. Considering the first attempt and the fact that patience is not a virtue in this kitchen, we were dubious even the thermomix version would be successful. Most recipes we’ve seen require between 6 hours to over night rising usually in two separate sessions. 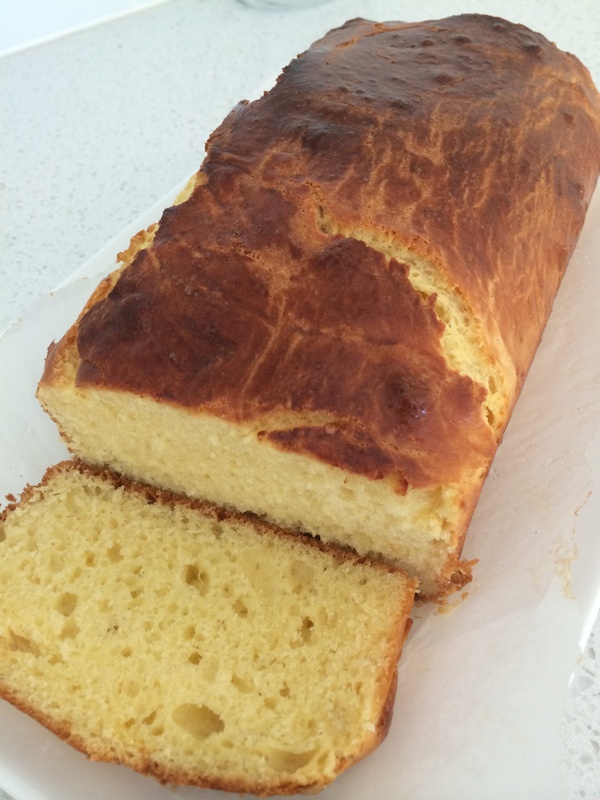 Just followed the guided recipe for brioche, and here’s the result. The dough was extremely soft and moist so wasn’t sure if it would turn out. But the cooked brioche is impressive, has a lovely soft buttery texture, slightly sweet, smells divine out of the oven. Had to leave the dough to rise for three hours but it’s worth the wait. Would be lovely Sunday brunch food. Was supposed to leave the loaf for a second rise one hour but wanted it ready for kids afternoon tea so just stuck it in the oven after the first rise. Baked 30 minutes later, the loaf is ready to slice. I suspect the top may have been more smooth and rather than cracked if it had been left to prove for another hour. But we can’t complain, who would have thought we could produce a bread just like the French bakery round the corner and better still it’s homemade.